Diamonds: they are dazzling, highly desired, and consequently very expensive. However, certain individual diamonds take expensive to a whole new level with figures totaling tens and even hundreds of millions of dollars. Colored diamonds, and yellow diamonds in particular, are so coveted and so valuable that some are considered priceless. How much would you be willing to pay for a yellow shiny diamond? How far would you go to get a hand on these pieces of jewelry? You will be surprised by how much enthusiasts and collectors have paid to get their hands on the five most valuable yellow diamonds. The Allnatt diamond is named after its first known owner, an Englishman and philanthropist by the name Ernest Allnatt. The diamond features a fancy vivid yellow color that beautifully illuminates and reflects light. It weighs an incredible 101.29 carat, which is equivalent to about 20 gr. What is even more impressive is that it has a clarity rating of VS2, which is highly exceptional for a diamond of its size. In addition to being magnificent, it has an air of mystique around it as no one really knows about its origin, although it is speculated to have been mined in South Africa. The Allnatt diamond is held with such high regards that it was once featured in a museum as a part of the Splendor of Diamonds, a famous sublime exhibition for diamonds. It is ranked alongside other famous diamonds such as the Steinmetz Pink, Heart of Eternity, and the Millennium Star. As you may imagine, the Allnatt diamond is amazingly large and elegant. It is also very expensive as it was last sold for over $3 million in 1996 at Christie’s Auction. The diamond’s current owner is the SIBA Corporation, and its value has undoubtedly increased over the past 20 years. The Mouna Diamond boasts of being the largest fancy intense yellow diamond to be graded by the Gemological Institute of America (GIA). It is named after its previous owner, Mouna Ayoub. Mouna was a beautiful Arab woman who had a taste of luxury and fashion, which her wealthy Saudi Arabian husband and businessman was more than capable of providing. Among her jewelries was a 112.53 carat yellow diamond, which is today known as the Mouna Diamond. This diamond has a flawless cushion shape measuring 26mm. It shines brightly when illuminated thanks to the fancy yellow, and coupled with its size it is impossible to miss. However, like most exceptional diamonds, few people ever get to see it. The Mouna Diamond was sold at an auction in Geneva for $3.258 million in 1998. Since it weighs more than the Sun-Drop diamond, it is estimated to be worth much more today. With a long history dating all the way back to 1877, it is hard to believe that this diamond has been worn by two women only in its entire lifetime. It was first spotted on Mrs. Sheldon White in 1957 during her attendance of the Tiffany Ball in Rhode Island. 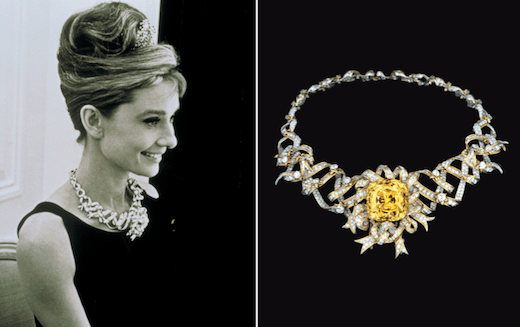 It was also worn by Audrey Hepburn who posed with it for photos for the popular Breakfast at Tiffany’s film in 1961. Since then, the diamond has featured on display at the Smithsonian National Museum of Natural History but it has mostly eluded the public spotlight. Since it was first purchased by Charles Tiffany, it is not clear whether the diamond has even been sold again or who it currently belongs to. However, it is valued at about $12 million. The Sun-Drop diamond is the world’s largest pear-shaped yellow diamond, and the most expensive of its kind as of 2011. It weighs 110.03 carat, 9 carat more than the Allnatt diamond, and is worth triple the latter’s price. The Sun-Drop diamond was discovered in South Africa in 2010, and cutting and polishing was done by renowned New York based company Cora International. True to the company’s reputation, the enormous diamond was shaped into a perfect replica of a pear, and this stylish design undoubtedly went a long way in increasing its value at the auction. This diamond set a world record after selling for $11.28 million, making it the most expensive yellow diamond to be sold since 2011. Its buyer remained anonymous, and it has not had much public exposure since then. However, as astounding as the price may seem, David Bennett, the chairman of Sotheby jewelry department, said that the figure was in range of what was expected. Hoda Esphahani, the president of SAFDICO USA Inc., even went ahead to suggest that vivid diamonds were still underpriced. The Graff Vivid Yellow boasts of being the largest cut yellow diamond in the world, and as of 2014 perhaps the most expensive yet. It is named after its commissioner, an English jeweler by the name Laurence Graff. It is also the work of renown New York based master cutter Nino Bianco, who designed it into an stylish and flawless cushion shape, which makes it all the more elegant and desirable. The original uncut diamond weighed an impressive 190 carat, which is more than 40 gr. The end product of Nino Bianco’s master work, however, weighs 100.09 carat but looks so much better than its original form. Its vivid yellow color shines brightly when illuminated, but since its sale few people have had the chance to observe the spectacular show. 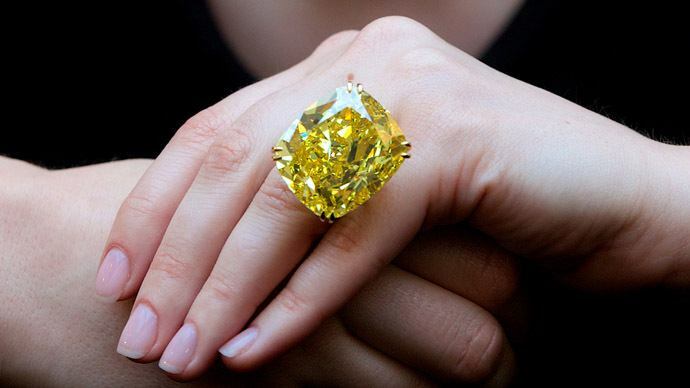 The Graff Vivid Yellow diamond sold for $16.3 million in 2014 at an auction held at the Hotel Beau-Rivage in Geneva. And, although this figure made a record, it still fell short of what was expected as its estimated price was a whopping $21 million. It is a surprise that diamonds have not replaced gold as the standard store of value, considering how resilient and expensive they are. Nonetheless, they are still some of the most expensive jewelry on the planet, and these five yellow diamonds in particular set the pace when it comes to price and beauty. There is no doubt that there is a steep price to pay for beauty, and these five most expensive yellow diamonds ever sold show just how steep the prices can get.